The Royal painter Fiona Graham-Mackay whose portrait of poet Sir Andrew Motion has been selected for the BP Award Exhibition at the National Gallery Portrait Gallery in London this summer and which is about to go on show at the National Gallery in Edinburgh has just written to Seychelles founding President James R. Mancham, saying that she would love to do a portrait of him as soon as possible. Fiona is one of Britain’s foremost portrait painters. Her painting of the poet Sir Andrew Motion was chosen by an international judging panel for the National Portrait Gallery out of 2557 entries from 80 countries. It will eventually hang in place of honour at the famous English public school, Radley College where Motion was a student. According to the Daily Telegraph, Fiona is also one of Britain’s foremost landscape painters with her work covering idyllic river and wildlife scenes in Britain to edgy landscapes and individuals in Pakistan and the Taliban country along the Afghan borders. She is one of the most sought after teachers on Paintings in Italy courses with followers coming from all over the world including New York, London, Pretoria and Paris to be taught by her in Venice, Sicily, Florence, Saragano and Montefalco. Fiona now runs teaching workshops for all levels of painters – beginners to stars – at her studio in East Sussex, England. Her first painting of the Royal Family was Prince Michael of Kent the President of the Little Ships Association commemorating the Dunkirk Rescue vessels during World War II. The Eccentric Club has asked Fiona to paint their patron Prince Philip. Fiona is of course married to Christopher Lee who authored the book, Political Castaways that was published in Great Britain in 1976 by Elm Tree Books Limited before Seychelles independence. This book was described as a story of the Seychelles – their history, people, natural resources and uncertain progress into the modern political arena. 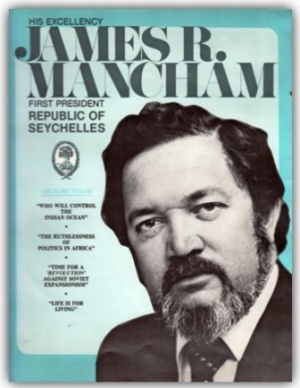 It is also the story of James Mancham’s determination that his islands will not disappear behind neon hotel signs, Soviet submarines bases and the indifference of our 20th century. Christopher Lee, recently Gomes Lecturer and Quarter centenary Fellow in Contemporary History at Emmanuel College Cambridge where he wrote the award winning BBC history of Britain, This Sceptred Isle. Christopher has just been commissioned by the BBC to write a play on the 1936 Abdication of King Edward VIII that will be aired in December 2016. He wrote Political Castaways at a time when he was also the BBC Defense Correspondent before becoming the BBC anchorman in Moscow during the Cold War. I am so concerned to hear of your “mild stroke”. How could this be? You are the one person who personifies to me the ideal - the one man I know who reflects Eden, even to the extent of overcoming its serpents. I read your article in the Nation. So very true that you inspired the notion of reconciliation after your 15 years in exile. Also, your concept of the need for reconciliation spreads far beyond the islands. I have sent a copy of your Nation comment to John Dickie who you may remember as the Diplomatic Editor of the Daily Mail and who Sir Alec Douglas-Home described as a true gentleman of the Press at a time when the Press had few gentlemen. When I attend UN and NATO meetings on world crises I mix with representatives of places like Yemen, Libya, Syria, Iraq, Afghanistan and the sub-Saharan states and hear them talking about co-operation knowing that not one of them really understands how to bring this about. We also have to accept that the traditional guarantors of reconciliation - for example, the USA & the UK - no longer have the power to help.